I recently met with OzAsia Artistic Director Joseph Mitchell in our Sydney office to discuss his expansive and thematically rich fourth festival. Mitchell’s knowledge of his field is deep and his enthusiasm contagious. In our 18 July edition, Ben Brooker spoke with Mitchell about several of the major works in his program: Danish company Hotel Pro Forma’s response to Japanese popular culture, War Sum Up, South Korea’s Dancing Grandmothers and Taiwan’s Secret Love in Peach Blossom Land. Mitchell introduces me to a substantial part of his program allocated to five female visual artists: Jeeyoung Lee (South Korea), Yee I-Lann (Malaysia), Kawita Vatanajyankur (Thailand, Australia), Anida Yoeu Ali (Cambodia) and Chiharu Shiota (Japan). I see that Jeeyoung Lee, whose creations are about revealing an inner sense of self, graces the cover of the festival brochure. It’s a good cover shot for the festival because it’s beautiful but at the same time it’s other-worldly, open to interpretation. 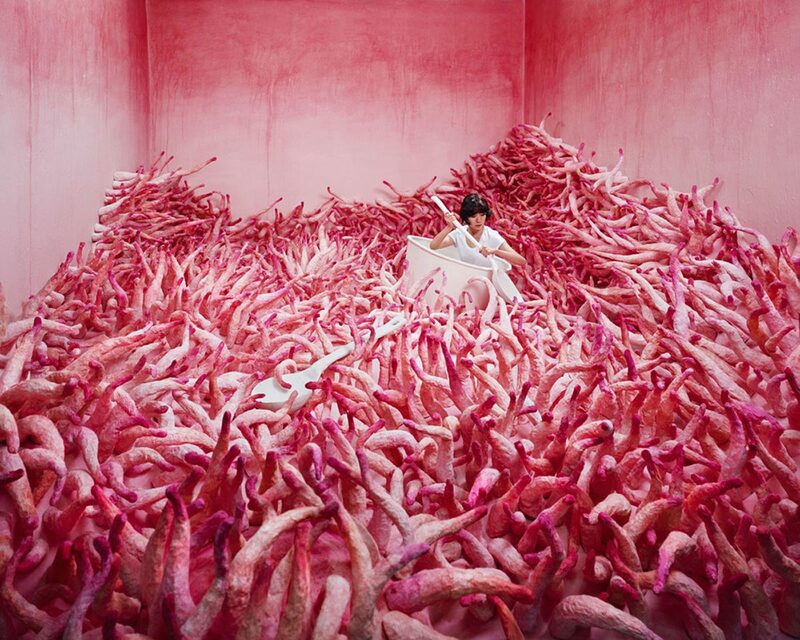 Jeeyoung Lee puts either herself or models into her installations to complete them. Her primary art form is photography but really she spends 98% of her time physically building her sets. In Adelaide she’ll build a brand new one the public can enter and be photographed in. Thai-Australian artist Kawita Vatanajyankur’s wonderful Scales of Justice series has a similar approach, with the artist’s body in the frame undergoing some surreally strenuous tests. It’s very much about representations of the burden of women’s labour. Tell me about Yee I-Lann’s Like the Banana Tree at the Gate; its images also feature photographs of women performing. Yee I-Lann’s three big digital collage prints are about a vengeful witch figure, the Pontianak, that exists all across South-East Asia and Japan. Using models in a studio, she re-imagines this spirit as a contemporary woman, addressing issues of gender and power. All of these five artists deal with how, as contemporary women, they’re recalibrating perspectives of certain narratives around female identity, most of which have been created by, framed by men in previous times. The festival brochure tells us about Anida Yoeu Ali’s Red Chador: In Memorium that “on April 6, 2018 Ali publicly announced the death of The Red Chador following an incident in Palestine where the artist’s original trademark costume went missing under suspicious circumstances.” What is the significance of the costume? Anida has been working on her Red Chador character for six or seven years. She created a big red, sequined chador and wears it in public places as a kind of provocation, a live art work. She’s done it in places like the Smithsonian and elsewhere in the US and in Paris. She’s addressing the idea of a Muslim woman in contemporary society, saying, “I’m not invisible. I’m here and I choose to wear this chador. I’m not a problem. Accept me for who I am. And that’s that.” Of course, it is provocative, one, because of the places she chooses to perform in and, two, I think there is still a long way to go to reaching harmony between our cultures. It’s not often you see a Muslim woman in contemporary society being so radical in terms of how she’s presenting herself. I think, whether she says it or not, she’s almost trying to normalise her identity, her culture, by provoking discussion —a lot of her work is photographed because it’s so visually appealing. She’s passionate and strong and very much sees herself as a political activist as well as a visual artist. We’re really thrilled about this part of our 2018 program. Anida is looking at dress and visual appearance as a tool to re-present perceptions of contemporary female Muslim identity. Yee I-Lann is doing something similar but using mythological figures and updating them for contemporary identity. Jeeyoung is very much about looking at her own internal psychology. She says, “These are my dreams, and this is how I interpret them and some of them are beautiful and some of them are scary and others are surreal. I’m in control of my own internal narrative for better or worse. This is what I see.” And then there’s Kawita’s work about women’s labour. The five pieces are all dealing with similar matter from different perspectives. What about Shiota’s work, which appears to be more abstract, but similarly existential. There are three parts to Shiota’s exhibition. This is the first big retrospective of her work. She really made it onto the scene with her [blood red] string installation Uncertain Journey (2016). The new work looks prior to that, to a turning point when she dreamed she was covered in string. In classic Art Gallery of SA style — a bit of the legacy of what the director Nick Mitzevich did for 10 years — they’re not going to create a discrete space for the installation. It will be positioned in the heart of the permanent collection. This is about disturbing the status quo as represented by the well-known works on display. I really admire how the gallery will never shy away from that. I’ve worked with them every year since I’ve been in Adelaide. One thing that’s immediately striking about your program is the number of countries represented and reaching beyond Asia. While some commentators worry at the increasing reach of China, some more broadly discern the rapid growth of a revitalised Eurasia. You have works from Syria and Iran, a Danish company responding to Japanese popular culture and Belgian choreographer Sidi Larbi Cherkaoui’s latest collaboration with China’s Shaolin monks. Yes, and it also works in the opposite direction in works like Andropolaroid 1.1 where a contemporary Japanese dancer Yui Kawaguchi, who has located herself in Berlin and whose solo work is about the journey of displacing herself from her home culture into another. There’s a heading-in-both-directions narrative. Sidi Larbi spent three months in a Shaolin temple, immersing himself. I don’t think he even went there to create a show, he just went and now he can’t stop. There’s a sense of displacement going on across the program. Artists sometimes voluntarily do that to open up their eyes. And, of course, some artists don’t have a choice. What kind of dancer is Yui Kawaguchi? She has a hip-hop/street style, a bit of classical ballet training, and contemporary. She merges all three, which is what’s interesting about her. At the same time, you could almost call her work an installation. Her husband is a lighting designer and the set comprises about 100 specifically placed drop lights all programmed to the nth degree. The work is a dialogue between her as a body in space and this extremely complex lighting arrangement…and a few other things that I won’t divulge. This is a really good example of how we break down perceptions of genre. You can look at it as a lighting installation that just happens to have a dancer moving through it, or as a dance piece. Tell me about the production from China, Here Is The Message You Asked For…Don’t Tell Anyone Else ; -) with a group of girls onstage living out their social media lives. Director Sun Xiaoxing is really the next big thing to come out of China. Here Is… is in the Theatre section of the program but it’s performance art. There’s structure but no narrative. The girls mumble in Mandarin but they’re not saying anything of narrative relevance, so we’re not doing surtitles. We want people to watch and read in the same way they’d watch contemporary dance. I was spellbound when I saw it. What’s so great about it is that it’s about a culture of young people — and I hate to generalise about generations — choosing digital existences in their bedrooms where they can live off their computers, social media, the internet, chatting with friends, eating chips and drinking Coca Cola and that’s it. And dressing up. The influence of the whole cosplay movement from Japan is also big in China and other parts of Asia. You watch a fishbowl of girls in their late teens to early 20s choosing not to engage with the world, or not in the way you or I might have [at their age], but to engage in a digital narrative that’s a reconstruction of their own lives based on the way they might want to see themselves. What’s so great about this is the director is making zero judgment. That’s completely up to the audience. You can see this as a valid existence or think, ‘Get a job!’ That’s what makes the work soar. You can also just watch or download WeChat and engage with the performers. Essentially, if you want there to be some form of connection, understanding and narrative you have to do it on the performers’ terms as fellow digital beings. There’s more to it than that but I don’t want to give too much away. A surprising presence, given the ongoing war, is a Syrian work, While I Was Waiting, by director Omar Abusaada and writer Mohammed Al Attar. It’s a really strong, solid piece of theatre from Syria that toured the big festivals in Europe last summer. I thought it was a really important piece to do. Syria and the Middle East are a part of the Asian continent. There have been two waves of Syrian immigration to South Australia, one in the 1980s and, of course, now because of the refugee situation. This is a large-scale company, 14 people, including seven actors and a big, two-tiered set in a major presentation by a group of artists who are telling a story of an average middle-class family living in Damascus in the middle of a horrific civil war. It’s set in 2014 and the premise that it’s based on is that a young friend of a friend of the director — in what is sadly not an uncommon occurrence — was beaten up at a security checkpoint by President Bashar’s men, is in a coma and found after going missing for six months. His family have to come back Damascus to see if he’s okay, if he’s going to live or die. Essentially, While I was Waiting gives us insight into the everyday experiences of people living in Damascus. What we get on the other side of the world on the nightly news is cities flattened by bombs, ISIS, corrupt governments, chemical warfare. But Damascus is still a fully functioning city with people going to work, going home. You can still see plays, movies, go on holidays. The play gives us an insight that we don’t otherwise get into one of the most highly talked about countries in the world — not for the right reasons, unfortunately. Again, it’s a very powerful piece in that the director sees the boy in the coma as a metaphor for his country, as neither alive nor dead…in a state of purgatory. The Malaysian play, Baling, has a political scenario drawn from the transcripts of an historic meeting between a British Government representative, the Malaysian leader and the Communist leader held on 25 December 1995 after seven years of civil war. This is immersive verbatim theatre. You’re not in a seating bank; you enter and move through rooms into different experiences. For the younger generation, it offers a fascinating insight into the complexity of the region and the world post-WWII as colonialism was basically being overthrown, and the role and impact that Communism had at the time. For the older generation who understood the withdrawal of the colonists it’s a recalibration, asking was the Communist leader Ching-pen trying to do something good or was he nothing more than a terrorist? The cast get divisive about it, take positions and audience too. This is real life drama. It could make an interesting comparison with Wild Rice’s HOTEL, a vibrant account of 100 years of Singaporean culture and politics very successfully staged at last year’s OzAsia . 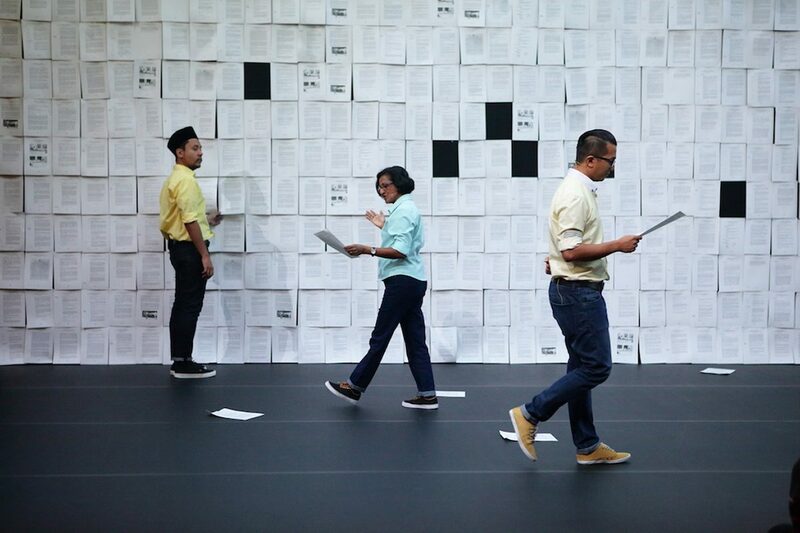 There’s a generation in South-East Asia now who feel comfortable going back, revisiting the narratives created by their parents’ generation and using the tools of contemporary theatre and performance to open up questioning so that history is not just clear-cut but open for debate. 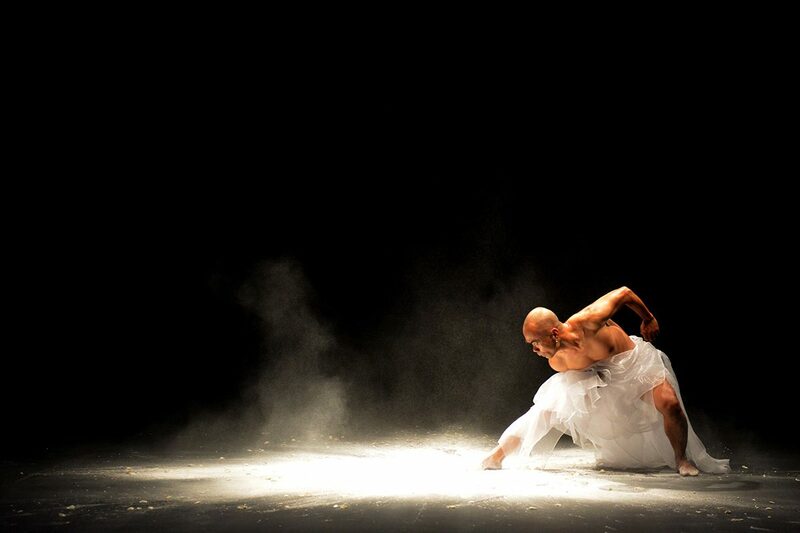 Where does the New Zealand-based Indian Ink Theatre Company’s The Guru of Chai fit in your program? It’s just a riveting piece of theatre with one actor and one musician but so much more than that. Jacob Rajan is a phenomenal actor who gives you a direct line into the extreme diversity of contemporary life in a large modern Indian city. Everything from poor street tea-sellers, such as his central character, to abandoned children begging in the street and corrupt politicians, government officials and local beat cops. It’s a no-holds-barred insight into contemporary India. Nassim, from Iranian writer Nassim Soleimanpour, will doubtless attract a large audience after the success of the widely travelled White Rabbit, Red Rabbit. This is one of my personal favourites. When I spoke to Nassim about the work he said, quite bluntly, that when White Rabbit, Red Rabbit went all around the world, he had to stay put. Of course, it was never performed in Iran. Since then, he’s moved to Berlin and has citizenship there. He thought, next time I write a play, I’m going to write myself into it and I might get to have some of the experiences that my play has had. It’s an interactive performance about language, Nassim wanting to let us know how important his mother tongue is to him and that he wrote this play with his mother in mind, as something she would understand and be proud of. Your mother tongue defines who you are and why those personal close connections are so meaningful. I see Eko Supriyanto, the maker of Cry Jailolo and Balabala, is back in Australia with a new solo work, Salt, exploring “the duality of the tensions between life-giving water and caustic salt” in the island cultures that make up Indonesia. Eko is essentially an exceptionally strong dancer as well as a choreographer. Salt is his physical response to life-changing experiences. 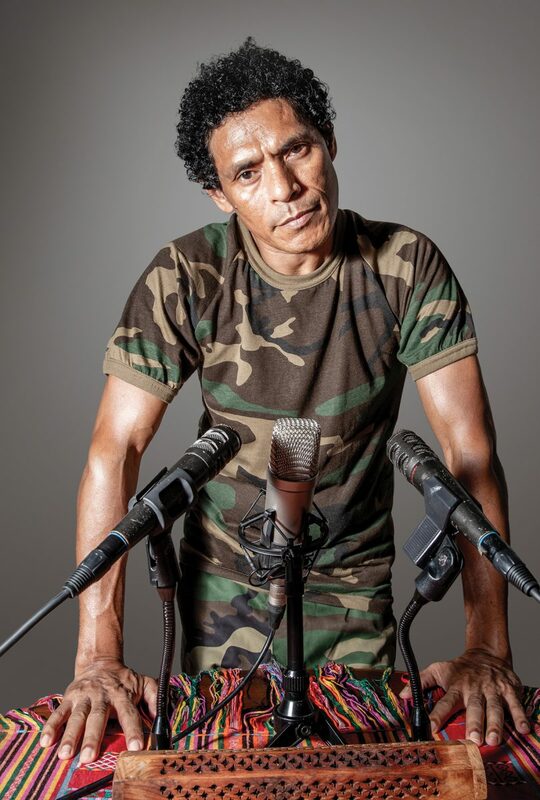 What’s really wonderful about it is that the first half is about him exploring his upbringing in Solo with Central Javanese dancing and then merging into the life-changing experience he had when he went out to North Maluku. We see Eko playing out these two completely different backgrounds. When he went from Solo to Maluku it really changed him as a choreographer. Sidi Larbi went to China and Yui Kawaguchi went to Berlin. Nassim talks about displacement of language in our modern society and how we have to go back to our mother tongues and not forget who we are. And the Taiwanese production Secret Love in Peach Blossom Land is about displacement because of the Cultural Revolution. In the Syrian work the characters are all displaced. Many come back to Damascus but some escape to Lebanon and Europe and some escape by smoking pot. Then you’ve got the Chinese piece with girls moving away from reality into a digital existence. Among Adelaide companies and artists, Tutti Arts are working with a large group of female artists from Malaysia and Indonesia, Alison Currie is collaborating with Singaporean dancers and Paolo Castro with a Timor Leste performer, while David Kotlowy, whose work I don’t know, is creating Patina, featuring dancers Ade Suharto and Shin Sakuma and visual artist Juno Oka. David Kotlowy is an Adelaide-based artist specialising in Indonesian and Japanese music. This year we’ve commissioned five productions by Adelaide artists collaborating with artists from other countries. Because I’ve been in Adelaide for three years now, it’s given me a chance to get to know local artists very well. Because we’re a festival, we can reach out to other festivals and producing partners so that these newly commissioned works aren’t simply produced once in Adelaide but have ongoing presentation possibilities around the world. So we’re doing Patina and Tutti Arts’ Say No More, and Alison Currie-Singaporean dance collaboration, Close Company, Paolo Castro directing actor Jose Da Costa from Timor Leste in Hello, my name is… And there’s Flower, a work for infants aged 4-18 months created by Sally Chance Dance and Korea’s Masil Theatre. Alison Currie’s show will do Singapore and then come back to Adelaide in September-October. Tutti Arts are doing Penang, then Adelaide, then Yogyakarta so that’s a three-way presentation. Hello my name is… will do Adelaide and then Portugal. There’s much more to OzAsia 2018: numerous forums, film (including a celebration of Thai film director Apichatpong Weerasethakul) and popular music outdoor concerts. Once again Joseph Mitchell has created an enticing program drawing on an expansive vision of Asia and delivering idiosyncratic regional creations and cross-cultural and often experimental works that further our sense of what is artistically possible, what is mutually advantageous and where displacements signal challenges that must be addressed.